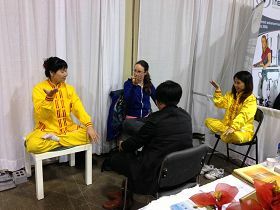 Local practitioners introduced Falun Gong to the public at the annual Total Health Show in Toronto, Canada, on April 5th-7th, 2013. The event was held at the Metro Convention Centre. Visitors streamed to practitioners' table, keen to acquire details about the practice. Some people learned the Falun Gong exercises on the spot. Those who knew about the persecution of Falun Gong in China showed their sympathy and expressed their support for practitioners. Another woman told practitioners, “It’s great to see you persistently doing what you need to do!” She said she saw hope in Falun Gong and spoke to practitioners at length about the evil-doings of the Chinese Communist Party and the calamities it has brought to mankind. One woman could not believe that the practice was completely free. She asked practitioners to teach the exercises to her and the group she worked with. “They are definitely going to be interested,” she said, referring to her coworkers. A woman from China was looking for a Buddhist practice. After listening to practitioners' explanation about Falun Gong, she expressed interest in learning the practice.